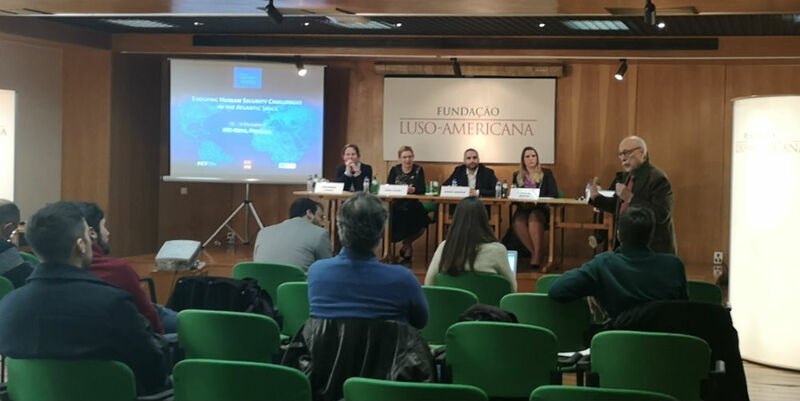 The Portuguese Institute of International Relations (IPRI) of the Universidade Nova de Lisboa hosted the Conference "Evolving Human Security Challenges in the Atlantic Space" at the headquarters of the Luso-American Development Foundation, in Lisbon. The event followed the third phase of the “Jean Monnet Network on Atlantic Studies”, coordinated by International Intelligence Unit of FGV (FGV IIU) and the result of a partnership between 10 research institutions distributed on four continents bathed by this ocean. The seminar had the participation of several specialists and researchers in the areas of International Relations and Maritime Security, as well as Professor Renato Flôres (director of FGV IIU) and international analysts of FGV IIU, Francine Martin and Leonardo Neves. The event allowed to awaken in a generation of academics and researchers the concern with the challenges of Human Security for the future of the Atlantic. The researchers emphasized a multicontinental and multidisciplinary approach to a modern understanding of Human Security. The sessions were attended by speakers from different continents such as Europe, North America, Africa and Latin America, allowing a broad view on international human security and diverse synergies and exchange of experiences. The objective was multiple: to address the old and new human security challenges in the Atlantic basin; understand terrorism and organized crime in light of fragile states; note the commitment to Human Security in the Western Mediterranean region and the implications for the South Atlantic Basin. There was also a synergy between the themes presented in the earlier stages of the project such as energy security in the human security framework and the exploration of Oil and Gas in the North Atlantic basin. The understanding of an urban sustainable infrastructure as an integrated solution for climate change, economic development and human security. The event provided a better understanding of the illicit drugs market in the Atlantic basin as a human security threat, a debate on international migration and the role of emerging technologies in the combat against illicit arms trade. A greater understanding of the challenges for regional and interregional security cooperation in the Atlantic area could be achieved in view of the increase in illicit networks. Moreover, note a parallel weakening of concerns for human security and development in face of the "Militarization" of African policies of the European Union and the United States. In addition to clarify the zone of peace and cooperation in the South Atlantic as a case of institutional resilience. The event will result in a book that will be published middle of this year and will be posted on the project's website as an open source for access to students, academics and opinion formers.